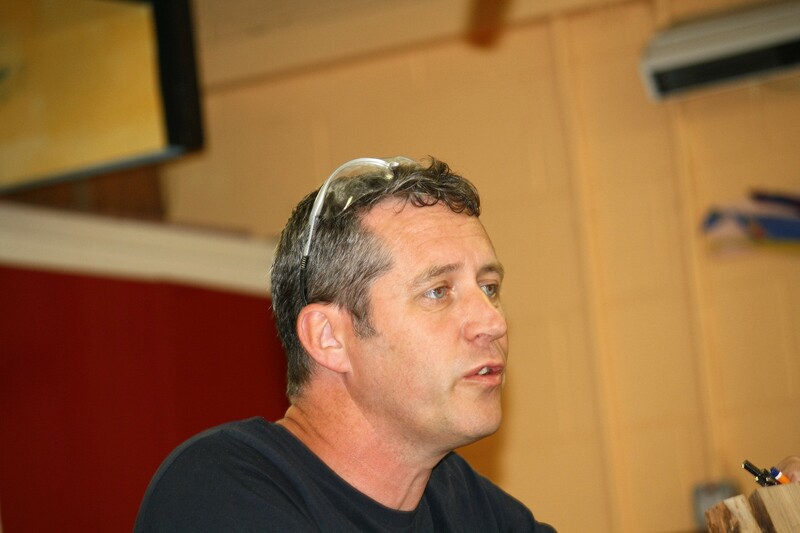 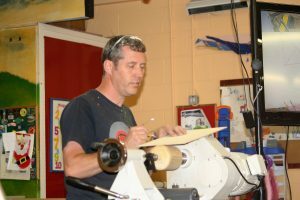 For our July chapter meeting we had the services of Kieran Reynolds as our guest demonstrator and what a very interesting, inspiring and informative demonstration it turned out to be. 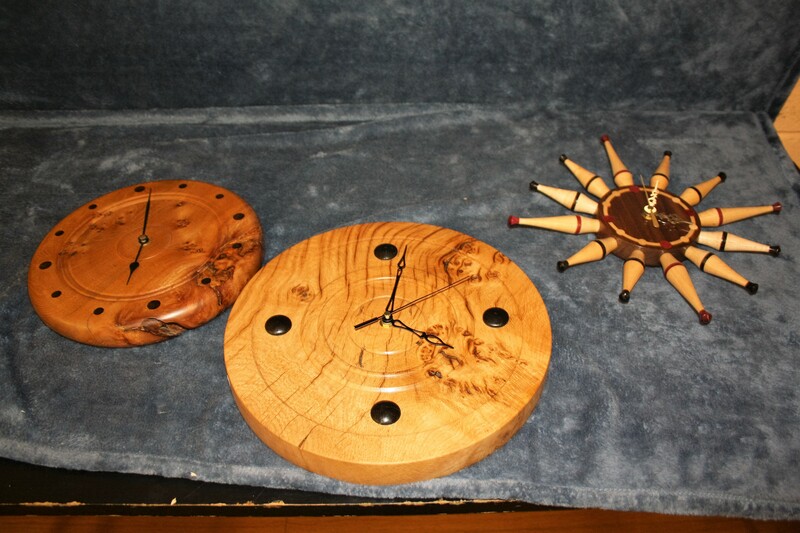 Kieran who is a woodwork teacher showed us how to turn out pieces both practical and artistic from wood which in some cases we might discard as being unusable or too small. 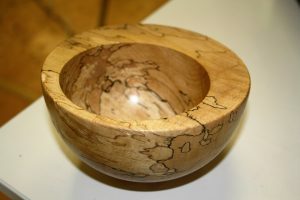 Unusable maybe because of cracks or other natural flaws but Kieran showed how these faults could be utilised to get some very artistic results and as to small pieces of wood, well with the use of a doughnut chuck these too can be turned into very attractive objects. 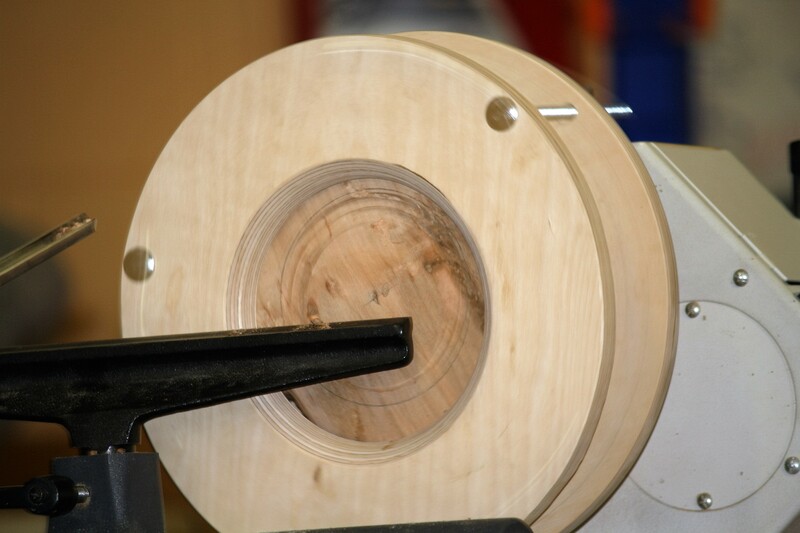 A doughnut chuck consists of a circular backplate, in this instance made of 15mm birch ply with a recess to mount on the lathe and an outer ring which is bolted to the backplate with three bolts evenly spaced around the ring. Dome headed bolts were used through the outer ring and wing nuts inside the ply backplate, the blanks are sandwiched between the two. As to the dimensions, the diameter is only restricted by the bed of the lathe and the length of the bolts will be determined by the thickness of the blanks used, fully treaded bolts of course to give flexibility, I have included some photos to help with my description. 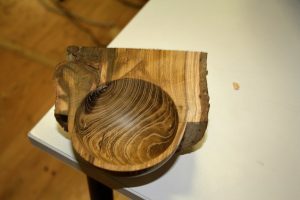 Kieran then proceeded to turn a few shallow bowls from burrs and rough-cut blanks held in the doughnut, some as thin as perhaps 40mm. 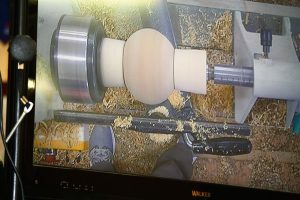 I liked the way he didn’t waste any time showing how to hollow out a bowl, he accepted we all knew how to do that, but concentrated on design and how to get the best out of the material, this way he was able to get through a lot more work. 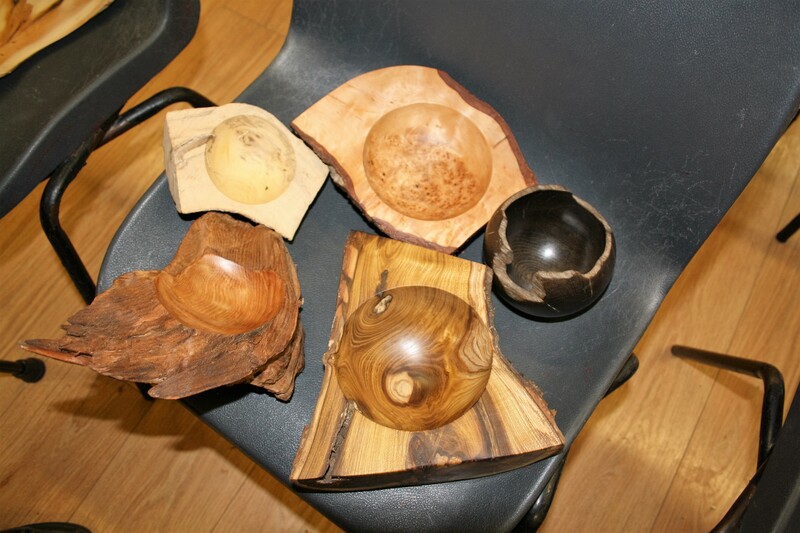 Kieran had with him some pieces he had prepared and finished, some spheres which were burnt and wire brushed (which brings out the contours of the grain) and these he mounted in the doughnut and was able to dish out in places to reveal the natural wood, arty pieces really, pleasing to the eye. 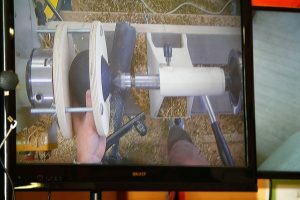 He then moved on to show us how to turn a sphere by simple mathematics, I don’t intend to go into details of this, you may know this method already and I’ve just been looking at U Tube and see so many ways of doing this so if you are turning spheres you will find a way that suits you best. The last object Kieran showed how to turn was an emerging bowl and this he turned from a log of Laburnum about 160/170mm in diameter and 250mm long, first turning a spigot he then mounted this on a chuck and turned a half sphere on the end. This has to be a perfect half sphere as the next stage is to split the log on the band saw (or other means) and on the cut face, at the centre line where the half sphere emerges you will mark the centre of the bowl you are about to hollow out. 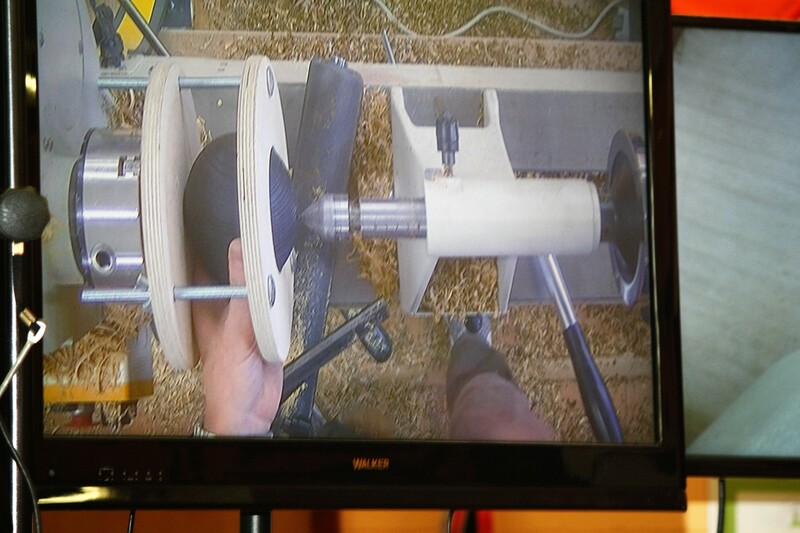 If you are still with me, use a compass to scribe a circle from this centre, this is then mounted in the doughnut chuck and hollowed out checking the thickness of the wall on the half sphere as you work, easy when you know how. 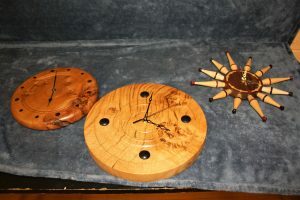 perhaps the photos will help you understand what I have being trying to describe. 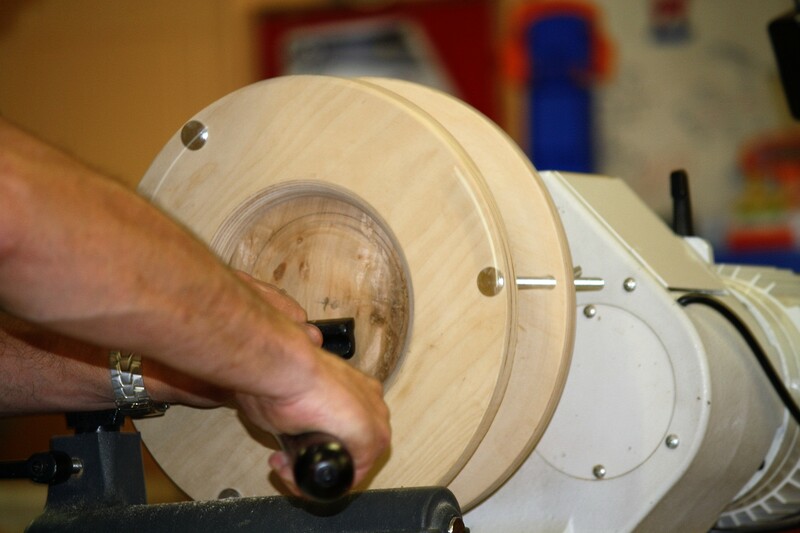 That was it, I have to say the time flew by, Kieran got a lot done in the couple of hours we had and I know from the feedback everybody enjoyed this very instructive demonstration, thank you very much Kieran look forward to seeing you again soon.